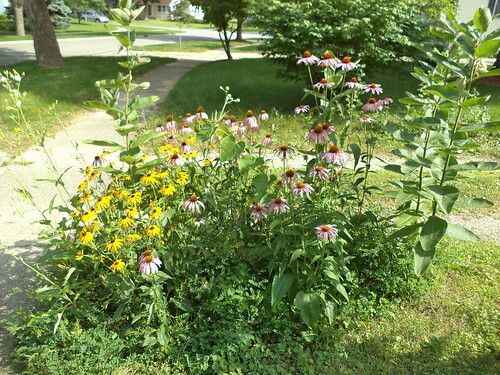 At the end of last month, I had monarchs in the prairie plants at the end of the driveway. I promised a view of those plants. 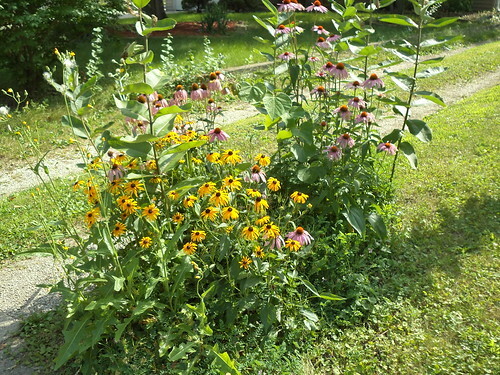 It's really just goat's beard, black-eyed Susan, purple coneflower, Rattlesnake master and common milkweed. There used to be white daisies in this, but they don't seem to have survived. I would love to add to this, increasing the size of the planting area by at least 2 feet. There are so many other plants which would go well in this location, as well as being an attraction for monarchs or other butterflies. Of course the issue is my ability to do the actual physical work of digging up the yard and these plants and adding top soil and peat to the area to make it a good location for plants. I have grand plans but reality can give you a swift kick to the shins. Supposedly, monarchs have laid eggs on milkweed now and the caterpillars should be happily eating their way through their chosen food. I have not seen any eggs and, thanks to this thing called "the Internet", I know what I'm supposed to look for. I've not seen caterpillars either. Maybe I won't see anything until a chrysalis forms. That would be extremely exciting. 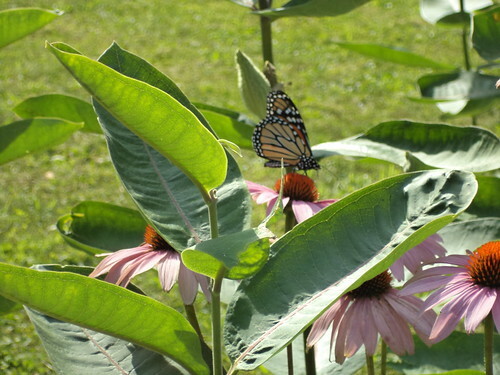 There would be daily blog photos as the butterfly develops. It's been a good year for the yard. I've seen hummingbirds and a very noisy blue jay for the first time in many, many years and I don't have, really, anything dedicated to them. The monarchs using the yard fill me with hope that, in spite of my shaggy garden, I'm doing something right. Here's to nature in her summer glory. "Now is the August of my discontent"